The BCC Lens Blur Dissolve is a 100% GPU accelerated replacement to or our original BCC Lens Transition filter. 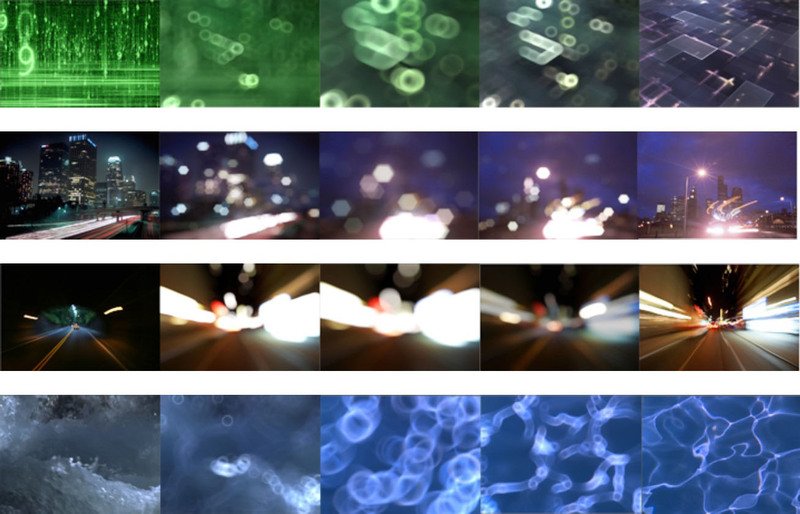 BCC Lens Blur Dissolve uses OpenCL to deliver greatly increased render performance with a streamlined interface. It applies a lens blur defocus/rack-focus style effect to the specular highlights of the outgoing and incoming image clips causing the highlights take on the shape of a simulated lens diaphragm. This filter includes a pop-up that can be used to match different looks that can be achieved in the physical world based on the lens aperture setting – a pleasing optical result is referred to in photographic terms as Bokeh. Like all of the other filters that are included in the Transitions category, BCC Lens Blur Dissolve includes user controls for the velocity of the transition with an optional on-screen display of the ease-in and ease-out velocity curve. Quality pop-up: 3 way pop-up used to set the quality of the edges of the generated highlights. Normal – The standard, fast mode. Sharp – Generates a sharper result but takes longer to render than the Normal mode. Sharper – Generates the sharpest edges but is the slowest to render. Circle – Generates circular highlights. 3-­16 Sides – Generates non-circular highlights with 3-16 sides Iris. Curvature: Similar to a pinch / bloat filter. Used to curve or smooth non-circular iris shapes. Iris Rotation: Used to set the rotation of the iris. Bokeh: Determines the overall look or bokeh of the Iris Shape – negative values erode the center of the shape, positive values erode the outside of the shape. Bokeh Shading: Used to set the softness of the bokeh – negative values produce a soft result, positive values produce a sharp result. Controls for color enhancements that auto-animate along with the transition. For example: boosting (or reducing) the Brightness or Contrast during the peak of the transition to maintain greater contrast, boosting intensity, or creating stylized variations of the basic dissolve. Dissolve – dissolves the two layers first and apply the blur to the output of the dissolve. Source Layer – applies the blur prior to the dissolve, but only to the source layer. Reveal Layer – applies the blur prior to the dissolve, but only to the reveal layer. Source and Reveal – applies the blur to both the source and reveal layers separately prior to dissolving between them. Off – disables the blur completely and just show the result of the basic dissolve. A Iris Scale: Scales the blur amount for just the Source Layer. B Iris Scale: Scales the blur amount for just the Reveal Layer. These parameters control the overall timing of the transition. On hosts which permit on-screen heads up display widgets (such as AE, Premiere, and Avid), you should never need to modify these sliders directly since they can be configured in a more convenient and intuitive manner by manipulating the widgets directly in your comp/preview pane. On hosts without heads up display widgets, you can use these sliders directly to fine tune your animation timing, taking advantage of the View Ease Curve option to help visualize the animation rates. Ease In: Controls how quickly or slowly the effect amount increases at the beginning of the transition. Ease Out: Controls how quickly or slowly the effect amount decreases at the end of the transition. Effect Delay: Controls the timing of the underlying dissolve relative to the timing of the rest of the transition. Negative values (recommended) cause the blur effect to begin prior to the underlying dissolve, whereas positive values cause the dissolve to begin prior to the blurring.